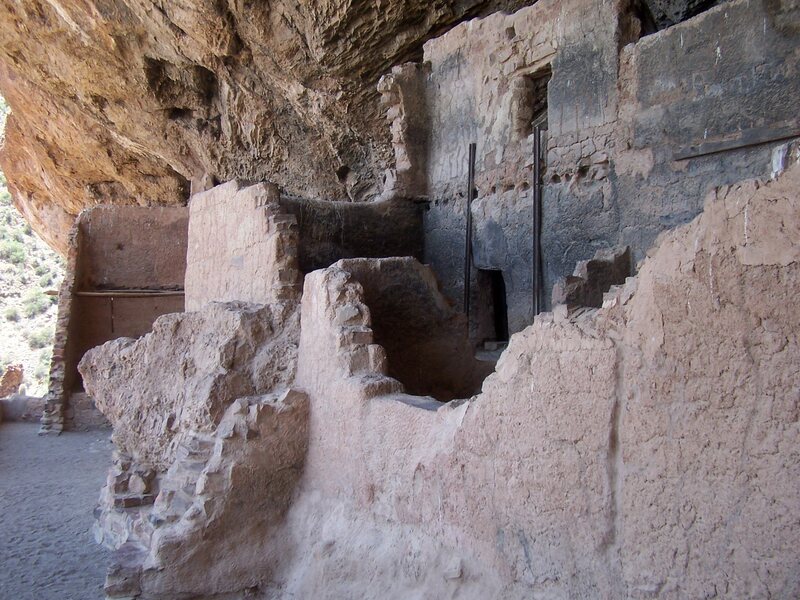 There was a flourishing Native American culture in the middle of Arizona, from 800 to 1400 A.D. Other national treasures in Arizona celebrate the Sinagua; this Monument is the only one that protects structures built by a related group of people we now call the Salado. The Salt River flows in the valley below, now providing the power for Roosevelt Dam four miles away. The Salado built these structures in cliff caves, high above the valley floor. 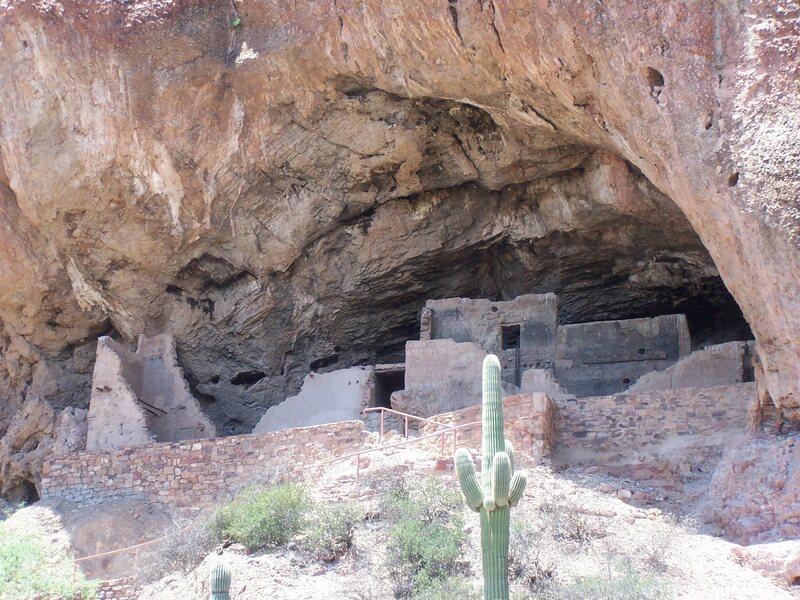 By the late 800's, the Hohokam had expanded upriver, out of what is now the Phoenix area, into the Tonto basin. Here they worked crops, hunted animals, and flourished for 300 years. Archaeologists pinpoint 1150 as a time of change, however, pointing to new styles of pottery, of construction methods and settlement patterns that signal a group of people different from the Hohokam: now we have the Salado. They were farmers, growing corn, pumpkins, cotton and beans. Indeed, the Salado are the one group in this area that grew and wove cotton. Some textiles still exist, indicating that they were familiar with weaving clothes. 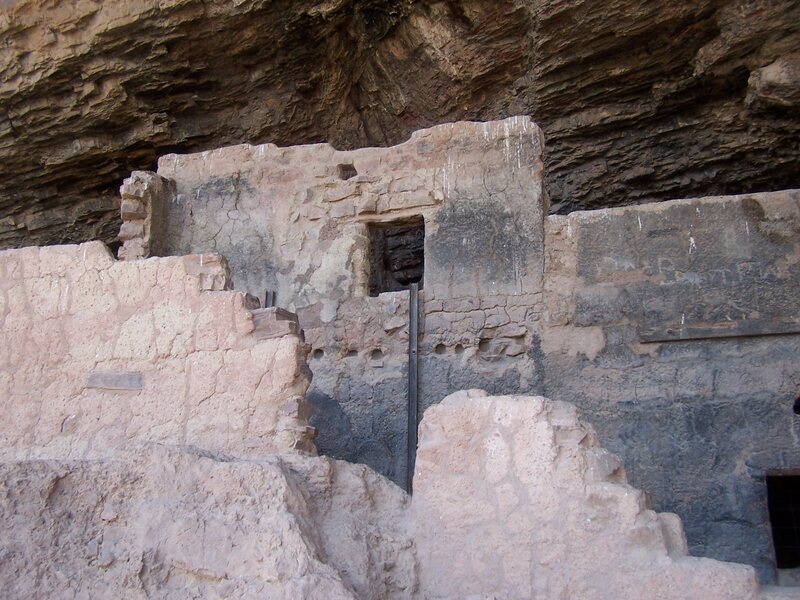 There are two main cliff structures, the Lower Cliff Dwelling and Upper Cliff Dwelling. It is thought they were built around 1300, and occupied for about 150 years before the Salado left, never to return. The Lower structures are available to the visitor by means of a 1/2 mile hike. This trail climbs about 350 feet, so allow yourself about an hour for the round trip. 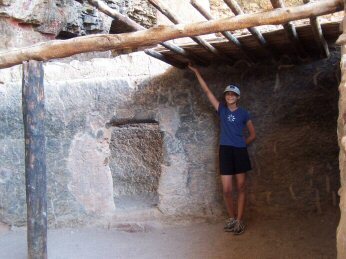 The Upper Cliff Dwellings are larger and more impressive, consisting of 32 rooms. However, visitors must be accompanied by Park staff; tours are offered only November through April. It gets hot here in the summer, folks. Guess what. The first time I visited Tonto I took my two older sons along, and we happily climbed the Lower Dwellings path until we ran smack-dab into a busy buzzing beehive. The rangers had warned us this might happen, and we chose valor over sightseeing. So I got only a glimpse of the dwellings, around a corner, and no good pictures. Lots of bees, however. So of course I had to go again. This time, although there still were bees around, the friendly ranger told us the bees had been 'quieted' the day before. Thus reassured, I went up with one daughter (leaving three carsick-queasy kids in the media room watching a film on Tonto) and we finally got to see the rooms left behind by the Salado. 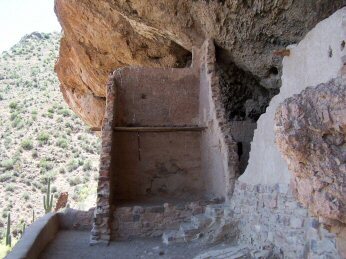 Tonto has a distinct advantage over other ancient sites in Arizona -- visitors may carefully walk inside these rooms. But please be careful, for the walls are fragile. Visitors are instructed not to touch the walls, the doorways, the ceilings or any of the wooden ribs that hold things in place. The doorways are small, and they make me wonder just how tall the Salado people were. If you make the long journey here, you've got to stop off at Roosevelt Dam. It's only four miles away from the Monument entrance, and is definitely worth the visit. It was built in 1906, entirely of bricks, and supplies the Phoenix area with steady water and electricity. It allowed Phoenix to start its remarkable growth. Whether that's a good result depends on your point of view. It does make me grateful for the modern conveniences, however, when I think of what the Salado people must have done to haul water, every day, from the river far below. The Visitors Center is small but well-stocked with books of local interest. There's a room up a flight of stairs where a 30-minute video describes the history of the valley and the ruins that lie 350 feet above. We arrived at 11:30 a.m. in late May, and apparently were the third group of the day. Tonto is not exactly crowded. From Phoenix, there are two ways to get to Tonto. I made the loop, and recommend it to anyone who's not afraid of 22 miles of graded twisting dirt roads. Take I-60 east to the Idaho Rd. exit in Apache Junction, and go north on Highway 88 for 48 miles. You'll pass three man-made lakes that help water the valley. The first two, Canyon lake and Apache Lake, are popular destinations for water-lovers. The last 22 miles are the dirt road part of the journey, but there are impressive views. Finally you'll see Roosevelt Dam, so take a few minutes to stop and read the descriptions at the parking lot. Follow the signs to the Monument, five miles down the road. Or, take I-60 east from Phoenix through Apache Junction. Continue southeast on Highway 60 for 50 miles to Highway 88 in Globe. Take that north for approximately 25 miles to the Monument. These roads are all paved, though some do twist and turn. Agua Fria National Monument is about 70 miles to the northeast, and Montezuma Castle National Monument is 80 miles that way. Hohokam Pima National Monument is somewhere nearby, Casa Grande Ruins National Monument is about 60 miles to the south, and Saguaro National Park is about 100 miles to the south. 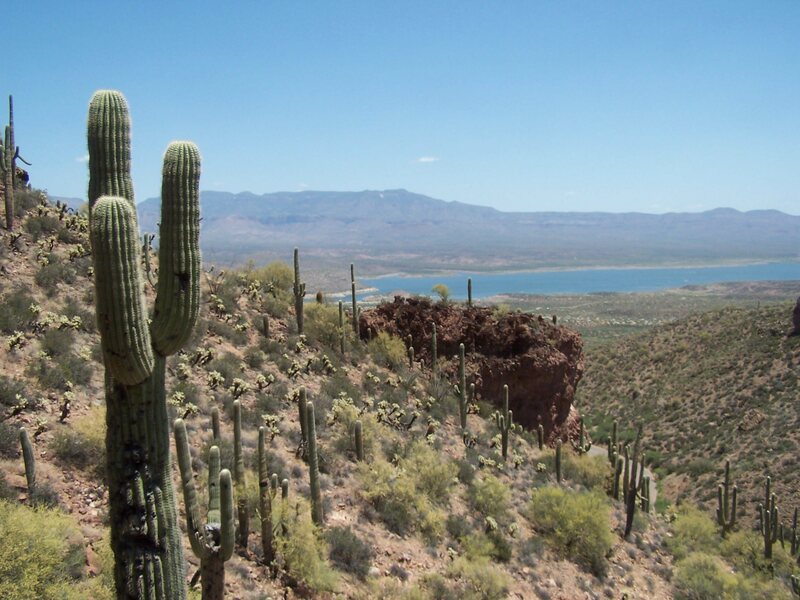 Ironwood Forest National Monument is about 80 miles to the southwest. Visited August 2002 and May 2004.